Home > Knowledge Center > What Is the Best Firewood for Fire Pits? You can buy firewood at grocery stores, gas stations and just about anywhere, but are those little bundles the best option or even the best value? These small bundles that usually run from about $5.99 to $7.99 are generally made up mostly of soft woods, such as pine. Soft woods are easier to light, which makes them more convenient for folks who are not well versed in starting fires or who just want a quick, occasional fire to gather around with friends and a glass of wine. Soft woods also burn quickly, which means you are going to go through more wood if you want your fire to last hours into the night. So, while soft woods are great for starting fires and you can easily pick some up on your way home from work, you will get a better value for your money if you purchase better firewood from a local firewood supplier or tree trimmer. To help you determine the best firewood for firepit use, we have compiled a list of 10 of the best firewood options available in Southern California. Before we look at some of the best firewood for fire pits and outdoor fireplaces, let’s take a moment to go over some types of wood you should never burn. According to the Environmental Protection Agency (EPA), you should never burn any wood that has been painted, stained or pressure treated. Coated and treated woods can release toxins into the air when burned, so should always be avoided. This means that your old fence boards, left over treated wood from building your deck and most pallets should be reused or disposed of in another manner. Some wood pallets are not made from treated wood and are okay to burn, but you need to be sure your pallets are not treated before breaking them up and tossing them in your fire pit. You should also never burn driftwood, particle board or plywood, since they can also release toxins into the air when burned. The EPA also states that you should never burn “wet, rotted, diseased, or moldy wood” in your fireplace or fire pit. It is generally recommended to avoid soft woods, such as pine or cedar, which tend to burn fast with excessive smoke. While you can use these woods in your fire pit, you will end up going through a lot more wood and, if you are using them in a fireplace, you will likely have more creosote buildup. Side Note: While this article focuses on best wood for firepit use in your backyard, it should be noted that there is an additional rule to abide by if you are going camping or are on a road trip. You should always buy local wood at your destination for use only at that destination. Do not bring wood from home on your camping trip and do not bring home leftover wood bought at your destination. When you transport firewood, you may be inadvertently transporting invasive pests as well. Black oak is a readily available hardwood found throughout Southern California and is one of the best firewood for firepit options if you want a fire that burns slow and steady to last through the evening. You will want to use black oak that is well seasoned, which means allowing it to dry out for about a year. In some cases, you may find you have to season different types of oak a full two years before it ready for use, but usually one year will suffice for this one. Black oak does not produce quite as much ash as some other types of oak, so it makes for easier cleanup. White oaks are also common in Southern California, which means you should have no trouble finding this firewood. This one produces more ash than the above-mentioned black oak and other oak options, so that might make it a bit less appealing, but it burns long and hot, which makes it a solid addition to any list of best wood for fireplace and fire pit use. This hardwood found in coastal regions can be difficult to split, so if you happen to lose a Coast Live Oak on your property, you may want to rent a log splitter or hire a local tree trimmer to split it for you. But, once you manage to cut it down to size, you will have a long-burning firewood that burns hot without a lot of smoke. Like most oaks, you will have to make sure you put out the fire completely before you retire for the night, since oak firewood can smolder for hours. Valley Oak is another California native hardwood that makes great firewood for fire pits and patio fireplaces. Like other oaks, this one may take about two years to season. Once dry and ready for use, Valley Oak firewood burns long and slow. While oak firewood options are more expensive than softer woods, you will use less wood and get more bang for your buck. Walnut is another hardwood that is usually easy to find in Southern California. Walnut is a long-burning option that does not emit a lot of smoke, so it is a good choice for fire pits and patio fireplaces during social gatherings. Once you get the fire going, you will not have to interrupt your evening repeatedly to add more wood to the fire, so that is an added bonus for party hosts. Avocado burns faster than the above-mentioned hardwoods and will leave a heavier creosote buildup when used in fireplaces. This means you will go through more wood and will have to add more wood more often throughout the evening. Since it creates more creosote buildup, it is also best to avoid using it in fire features with chimneys and is best used in fire pits. There are two reasons avocado firewood makes this list: It is good for starting fires (and then adding some oak for longevity) and it is abundantly available for folks who have orchards or live near avocado orchards, which are common in Southern California and Central California. This hardwood burns hot and slow and leaves behind less of an ashy mess than most hardwood options. Madrone firewood may be a little more difficult to find and will cost more than softer woods, but you will get a long-burning, warm fire from it. Like oak, madrone will leave coals that are still warm in the morning. This makes it a popular choice for folks living in colder climates using firewood for heat. But, for those of us using it in fire pits in Southern California, this means you will need to make sure your fire is completely out at the end of the night. Split this one while it is green, since it will be increasingly more difficult to split as it dries out. While some oak firewood can take two years to dry out, madrone is usually well seasoned and ready for use after one year. 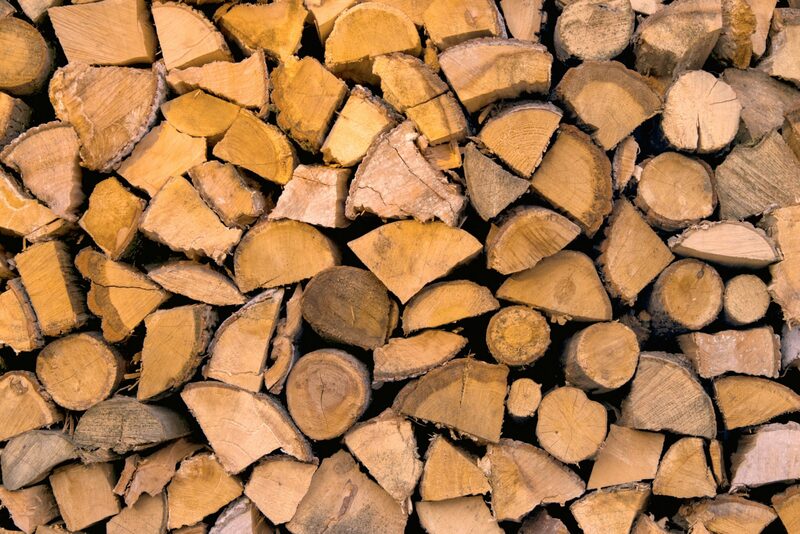 Almond wood is usually much harder to find than more popular firewood options, such as oak firewood. However, if you live in an area with almond groves, you may have the opportunity to buy this excellent option. This is another hardwood that will cost more than some of your other available choices, but it seasons quicker than oak and provides you with long-burning logs and less cleanup after you put the fire out. Bigleaf Maple is a hardwood, but it has lower BTUs than choices like Pacific Madrone or oak. This means that it does not give off as much heat. 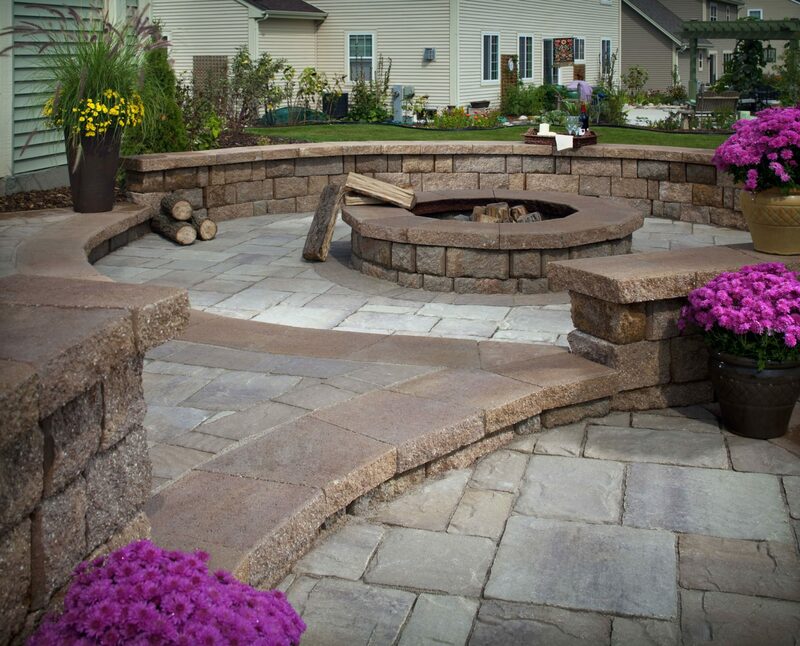 This will matter for folks looking to use their fire pit or patio fireplace as a heat source but will not really matter to folks who mostly want a welcoming fire feature during social gatherings or for sipping wine by the fire with your partner. Bigleaf Maple firewood is generally less expensive than oak or madrone. It is also easier to light so, while a maple log might not burn as long as an oak log, it is easier to get your fire going, and maple will still burn longer than soft woods. It also seasons faster than oak firewood. Ash is easier to split and easier to light than many hardwood options. Another bonus is that you can actually burn this one while it is still green. It is, of course, better to wait for it to season, but it will burn just fine even before it dries out completely. Ash does not burn as long as oak, but it gives off a good amount of heat without a lot of smoke, so this is an excellent choice for outdoor fire features. There are several other woods that could easily make a list of the best firewood for firepits, such as cherry, apple and hickory. They are not included here simply because they are not abundantly available as firewood options in Southern California. Almost all woods should be seasoned for at least six months before use. Always cut firewood to lengths that fit easily and completely inside your fire bowl or fire box. 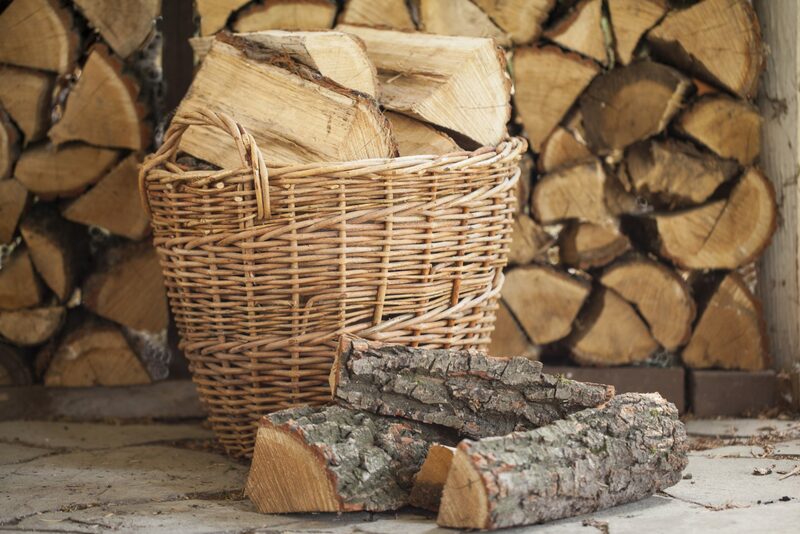 Store firewood covered and off the ground to limit pests and avoid rot.